Terms, Conditions, and Notices Agreement between user and Akron Today Magazine. This Web site is owned and operated by Akron Today Magazine, offered to the User conditioned on acceptance by the User without modification of the terms, conditions, and notices contained herein. Use of the content, services, and/or products presented in any and all areas of this site constitutes the User’s agreement to abide by the following terms and conditions and those posted in specific areas of the site. All contents of this Web site are: Copyright© 2013 Akron Today Magazine. PO Box 295 Kent, Ohio 44240 U.S.A., or third-party content providers and are protected by international copyright law. All rights reserved. Akron Today Magazine, and other names of Akron Today Magazine products referenced herein are trademarks or registered trademarks of Akron Today Magazine Other trademarks/logos are the property of their respective owners. ALL MATERIALS AND SERVICES IN THIS SITE AND THIRD-PARTY SITES TO WHICH IT LINKS ARE PROVIDED “AS IS” WITHOUT WARRANTY OF ANY KIND. THE CONTENT PUBLISHED ON THIS WEB SITE MAY INCLUDE INACCURACIES OR TYPOGRAPHICAL ERRORS. CHANGES ARE PERIODICALLY MADE TO THE INFORMATION HEREIN. Akron Today Magazine AND/OR ITS SUPPLIERS MAY MAKE IMPROVEMENTS AND/OR CHANGES IN THIS WEB SITE AT ANY TIME INCLUDING CHANGES TO THESE TERMS AND CONDITIONS. Akron Today Magazine AND/OR ITS SUPPLIERS MAKE NO REPRESENTATIONS AND, TO THE FULLEST EXTENT ALLOWED BY LAW, DISCLAIM ALL WARRANTIES, EXPRESS OR IMPLIED, INCLUDING, BUT NOT LIMITED TO WARRANTIES OF MERCHANTABILITY AND FITNESS FOR A PARTICULAR PURPOSE REGARDING THE SUITABILITY OF THE INFORMATION; THE ACCURACY, RELIABILITY, COMPLETENESS OR TIMELINESS OF THE CONTENT, SERVICES, PRODUCTS, TEXT, GRAPHICS, LINKS, OR OTHER ITEMS CONTAINED WITHIN THIS SITE, OR THE RESULTS OBTAINED FROM ACCESSING AND USING THIS SITE AND/OR THE CONTENT CONTAINED HEREIN. Akron Today Magazine DOES NOT WARRANT THAT THE FUNCTIONS CONTAINED IN THE MATERIALS WILL BE UNINTERRUPTED OR ERROR-FREE, THAT DEFECTS WILL BE CORRECTED, OR THAT THIS SITE IS FREE OF VIRUSES OR OTHER HARMFUL COMPONENTS. THE USER ASSUMES THE ENTIRE COST OF ALL NECESSARY MAINTENANCE, REPAIR OR CORRECTION. Use of this site is at your own risk. This site may contain advice, opinions, and statements of various information providers and content providers. Akron Today Magazine does not represent or endorse the accuracy or reliability of any advice, opinion, statement or other information provided by any information provider or content provider, or any user of this site or other person or entity. Reliance upon any such opinion, advice, statement, or other information shall also be at your own risk. Neither Akron Today Magazine nor its affiliates, nor any of their respective agents, employees, information providers or content providers shall be liable to any User or anyone else for any inaccuracy, error, omission, interruption, timeliness, completeness, deletion, defect, failure of performance, computer virus, communication line failure, alteration of, or use of any content herein, regardless of cause, or for any damages resulting therefrom. This Web site may contain links and pointers to Internet sites maintained by third parties. Akron Today Magazine does not operate or control in any respect any information, products or services on such third-party sites. Third-party links are included solely for the convenience of Users, and do not constitute any endorsement by Akron Today Magazine and/or its suppliers. User assumes sole responsibility for use of third-party links and pointers and disclaimers set forth herein are equally applicable to such third-party sites. Akron Today Magazine is a distributor with regard to content supplied by third-party suppliers and Users, therefore, Akron Today Magazine has no more editorial control over such content than a public library, bookstore or newsstand. Any opinions, advice, statements, services, offers, or other information or content expressed or made available by third parties, including information providers and Users are those of the respective author(s) or distributor(s) and not of Akron Today Magazine. Any software that is made available to download from this Web site (“Software”) is the copyrighted work of Akron Today Magazine’ suppliers. Use of the Software is governed by the terms of the end-user license agreement, if any, which accompanies or is included with the Software (“License Agreement”). End users shall not install or use any Software that is accompanied by or includes a License Agreement, unless the end user first agrees to the License Agreement terms. Any such software is not available to Users in territories where its distribution is prohibited by law. Akron Today Magazine respects the privacy of its readers and shall not disclose, distribute or rent its E-mail subscriber newsletter list to any third party, nor shall it permit anyone else to do so. Akron Today Magazine shall have the right, at its discretion, to change, modify, add or remove terms of this agreement at any time without notice. Changes shall be effective immediately. You agree to review this agreement periodically since subsequent use by you of this site shall constitute your acceptance of any changes. Akron Today Magazine shall have the right at any time to change or discontinue any aspect of the web site, including, but not limited to, the community areas, content, hours of availability and equipment needed for access to use. Such changes, modifications, additions or deletions shall be effective immediately upon posting and any subsequent use by you after such posting shall conclusively be deemed to be acceptance by you of such changes, modifications or deletions. This agreement is effective until terminated by Akron Today Magazine, at any time without notice. Under no circumstances, including, but not limited to, negligence, shall Akron Today Magazine, or its affiliates be liable for any direct, indirect, incidental, special or consequential damages that result from the use of, or the inability to use, Akron Today Magazine’ materials. You specifically acknowledge and agree that Akron Today Magazine is not liable for any conduct of any User. As a condition of use of this Web site, the User agrees to indemnify Akron Today Magazine and its suppliers from and against any and all liabilities, expenses (including attorneys’ fees) and damages arising out of claims resulting from User’s use of this Web site, including without limitation any claims alleging facts that if true would constitute a breach by User of these terms and conditions. If you are dissatisfied with any Akron Today Magazine material, or with any of Akron Today Magazine’ terms and conditions, your sole and exclusive remedy is to discontinue using the Akron Today Magazine Web site. Akron Today Magazine reserves the right to make any and all changes to this Web site at its sole discretion without notice to the User. Akron Today Magazine reserves the right to deny access to this Web site to anyone at any time. Akron Today Magazine and it’s parent company, Liquid Learning Inc make no claim to the specific number of ad views, clicks, interactions and leads. Data and traffic is provided from 3rd party vendors and to the best of our ability we report these items to clients accurately. Results are not guaranteed and vary widely from advertiser to advertiser. 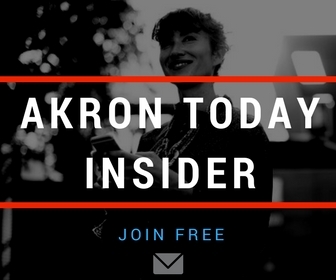 Akron Today does not misrepresent or knowingly falsify information in articles or ads, but also does not verify every detail advertisers and sponsors provide. Ads and Articles may be modified or removed at any time by magazine. Under no circumstances, including, but not limited to, negligence, shall Akron Today Magazine, or its affiliates be liable for any direct, indirect, incidental, special or consequential damages that result from the advertising, inclusion, use of, or the inability to use, Akron Today Magazine. You specifically acknowledge and agree that Akron Today Magazine is not liable for any conduct of any User or any specific advertising results. Contact us with questions or problems with this web site. Any rights not expressly granted herein are reserved. Akron Today Magazine – has created this privacy statement in order to demonstrate our firm commitment to privacy. The following discloses our information gathering and dissemination practices for this Web site. This information may be updated or changed without notice. Akron Today Magazine will not sell the personal data of visitors to anyone else without your consent. If a business directory listing has information you do not want to display you may claim the listing and change it for yourself or contact us and request a change. This site contains links to other sites. Akron Today Magazine is not responsible for the privacy practices or the content of such Web sites. We sometimes ask visitors for contact information (like their email address) and demographic information (like their ZIP code, age, or income level). This information is not shared with third party without your permission. Demographic information may be shared with advertisers on an aggregate basis, but Akron Today Magazine will not disclose your individual identity or personal data without your permission. Any information you submit as part of a purchase you make through Akron Today Magazine is confidential and secure. Security service is provided by PayPal. Members’ personal information may be sold to vendors with products Akron Today Magazine considers suitable. Members may remove themselves from the list and directory by contacting us.